Coral Mobile has a strong focus on horse racing with excellent odds. Works on iPhone, Samsung, Sony Xperia, HTC, Motorola. 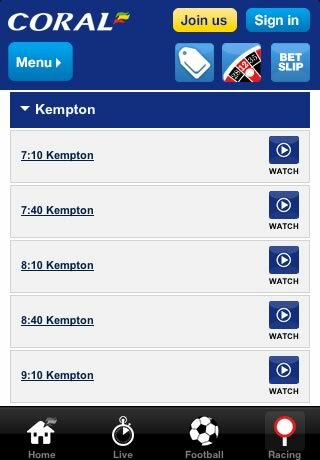 Live horse and greyhounds streams of every UK and Irish race. A synopsis of each race is provided by the Racing Post journal. Racing special section offers odds on flat and national hunt trainers. Bet £5 and get a £20 free horse racing bet when you join Coral. Coral are one of United Kingdom's biggest bookmakers and over the last decade or so have managed to turn themselves into a worldwide brand. They probably don’t get the recognition that some of their slightly larger competitors do, but they have been in the industry for almost 100 years after being founded way back in 1926. As with any UK bookmaker, horse racing plays a huge part in their turnover and with the sport being so popular back in the motherland, it's no surprise to see Coral give it the type of coverage it already has. We are going to use this review to basically see how well the sport is covered from their betting app. From the minute you open up the Coral app you will immediately see how popular horse racing is. 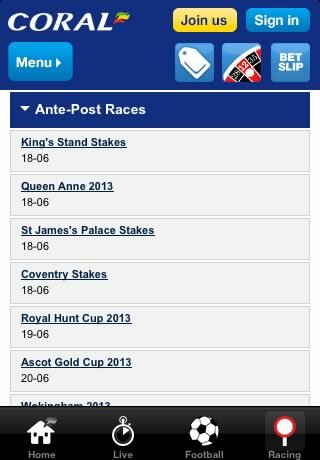 It's likely that the homepage will include a number of upcoming races along with the footer, which runs constant throughout the app, having a quick link to go straight to the horse racing HUB page. The homepage will also give you the option of going to said HUB page or simply clicking a button to see the next four upcoming races, which we found very handy as a quick link. The racing homepage is pretty simple in its design and is basically a list of drop down menus to choose from the market or event that you want to bet on. The top of this page includes 5 buttons listed as next four races, today's racing, tomorrows racing, futures and results. The first menu you are brought to is Coral's Enhanced Multiples where essentially they provide enhanced odds for certain outcomes for races throughout that day. What we liked about this is that it changed for each day and it provides excellent value compared to that of pricing across the industry. 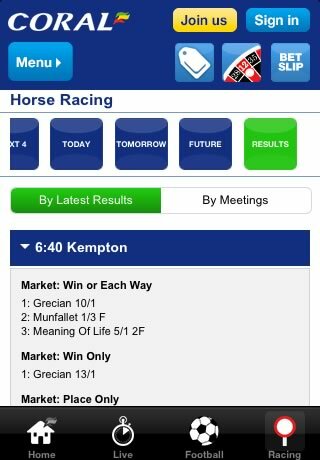 More often than not, you will find these odds to be industry best priced. A nice and relatively new addition to the app is their results tab. 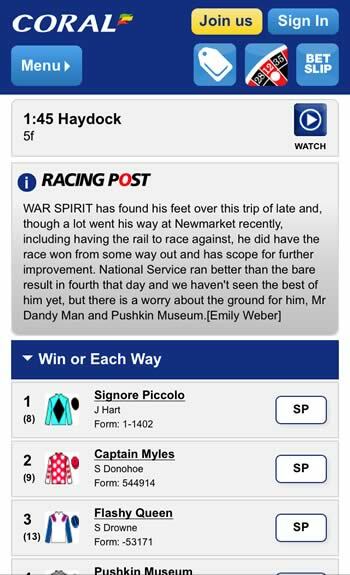 Whilst most horse racing apps do include this in some form, it's good to have a dedicated section to quickly jump to and see the outcome of certain races. It includes all the paid places along with starting price as well. There's little information on top of that and ideally we would have liked to see something along the lines of Tote price, distance won by and possibly time ran, which are all increasingly popular betting markets for the sport. Whilst not necessarily a feature of the app, we probably should make you aware that for the majority of races in the UK and Ireland, Coral actually offer a best priced guaranteed on their odds. This means that should you take a price before the start of the race and for that horse's starting price to drift to longer than the price you took, Coral will pay out at the higher starting price. It's actually something quite a few bookmakers offer these days, but it's always a nice addition to see. The race card is a standout feature on the app and we felt that it provides as much information as you are really going to see from such a feature. To start with you will get all the standard information from the runners and riders such as starting price, silks, horse number and jockey number. But you can actually click on each horse to see a little break down of information on how that horse might run direct from the Racing Post. It even gives you information about the Sire which is something we haven't seen all that often from betting apps. On top of that you can click the details tab which will show you jockey, trainer, form, age, weight, stall number and rating. Coral also provide live streaming for a good number of races taking place. These are mainly ones from the UK and Ireland but the stream is actually pretty solid for each. All you need to do to activate the stream is bet £1 or more on a race before the streaming button then becomes available to click. The races are set as 'live' but please be aware that there could be a delay of up to 10 seconds on each stream, depending on connection. 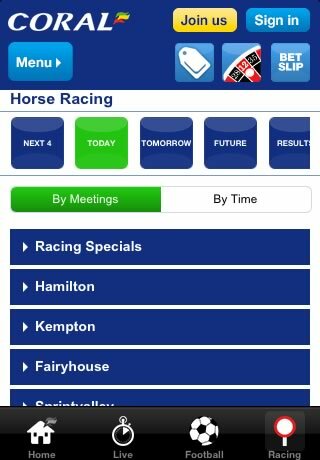 A relatively new addition to the app is the inclusion of racing specials. The specials markets are always something that we find a bit of fun more than anything, but you can choose from markets such as flat jockey champion, trainer champion, national hunt specials and also certain trainer specials as well. 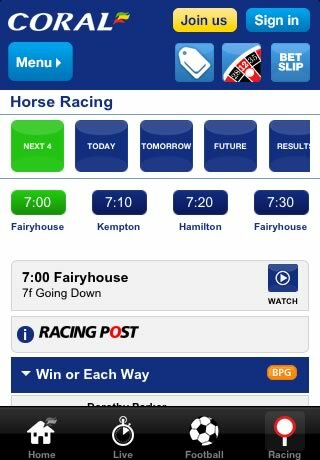 It's time for a few home truths about the Coral horse racing app. It's not the best looking app we have come across, by any means. It's pretty basic in all honesty in terms of design and whilst it actually loads reasonably well as result, we agreed that it wasn’t the easiest to navigate about. The selections felt really small and it was often fiddly to make sure you clicked the right button. This wasn’t an issue when making bets as these boxes were more than plentiful, but when trying to navigate between markets, we often found ourselves on the wrong screen. Another feature that we found annoying was the lack of a back button. If you found you'd gone too far and wanted to move back one level then you couldn’t and more often than not had to go back to the home page then start again which was very frustrating. Having said all that, these were niggles more than anything and it could be a case of what works for one person, might not for another. 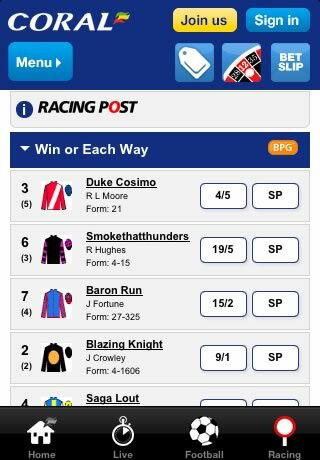 Overall we were quite impressed with the horse racing section of the Coral mobile betting app. For the most part it's pretty much flawless and the inclusion of both live streaming and Racing Post synopsis were pleasing and offered a great deal of depth to the horse racing section. Whilst you did have to wager at least £1 for the live streaming, we didn’t think this to be extortionate and to be honest, is pretty much in line with the majority of bookmakers. The only downside that we really had with the app came in the design department and whilst it isn’t a terrible design, we found it to be a little bit dated, especially when Coral's rivals were bringing our more polished designs in 2014.